This 30 Minute Jambalaya Recipe has just the right amount of heat and is perfect for feeding a large crowd! While I love Mexican food, I am always willing to try new recipes as well, like this easy 30-minute Jambalaya. Jambalaya is a food that I had never tried until just recently. In Mexico it isn’t really something that you will see on many menus, and it really isn’t that common here in Colorado either. That said, I tried it at a restaurant for the first time not too long ago and I absolutely fell in love. Something about the the combination of flavors in this jambalaya is more than I can resist, and now I make this all the time for my family. I made this version with hot links, bacon and chicken for the protein, but you can also add shrimp if you want. 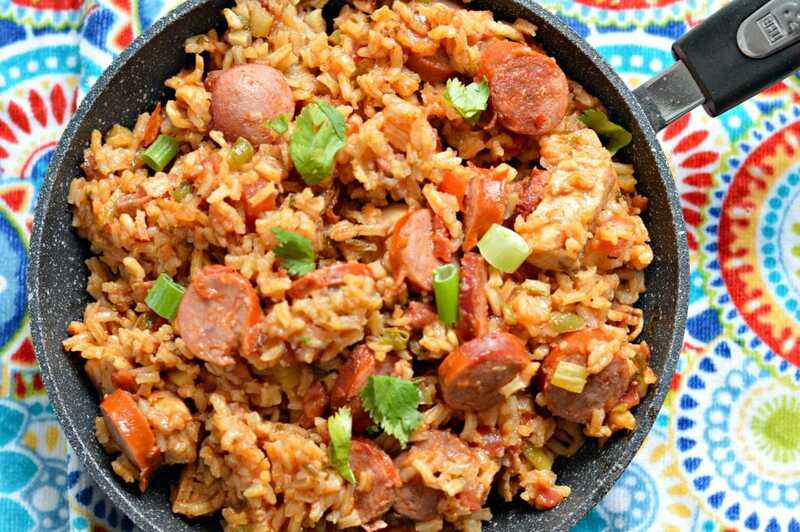 I love the different combinations of flavors that come from adding Hot Links and Bacon, combined with Cajun seasoning, rice, chicken and more! 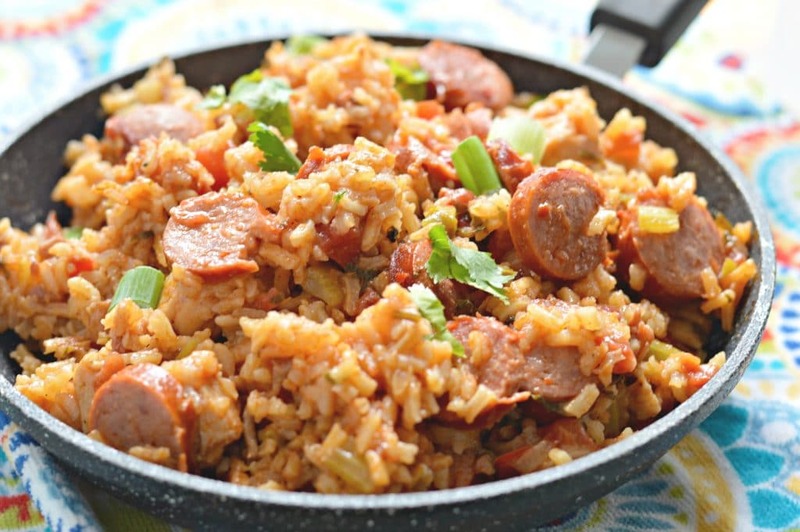 This jambalaya recipe has the perfect amount of heat, so it is a great option for everyone. I am a mom of three boys, so it is important for me to have easy access to recipes that I can make in a hurry. 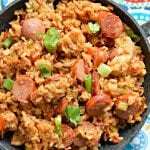 One of the great things about this particular jambalaya recipe is that you can make it in right around 30 minutes, so it is a perfect recipe for those days when you are in a hurry. It is also great for feeding a large crowd because it is so filling and makes a lot of servings. I made this for a family get-together recently, and everyone was going back for seconds and thirds. I hope that you enjoy this recipe as much as we did and that you have the chance to try it out soon! If you enjoy this recipe, check out these other favorites. Season the chicken with salt and pepper and cook together with the hot links in olive oil until cooked through. Add the bacon and let cook through. Cover and let simmer over medium high for 20-25 minutes (until the rice is done). This has become a weeknight staple in our house. I love that it contains so many fresh veggies. We sub chicken andouille sausage. I also cook veg, chicken, and bacon separately, then add together with rest of ingredients, as this helps it go a little faster. 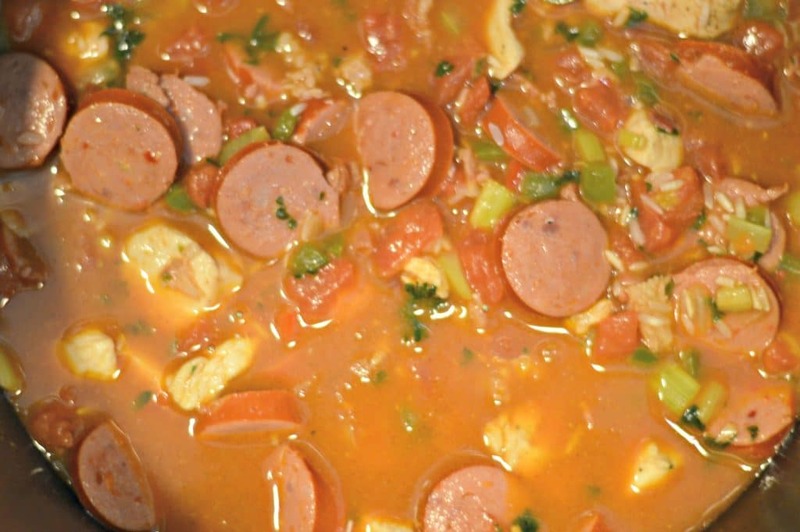 I never would’ve known how to make jambalaya without this recipe, let alone that it would be so doable in a short time. Delicious and healthy— a real hit!